A folding gym? What a home gym lover's dream. Maximize the space in your home with the Marcy Pro Foldable Cage System. 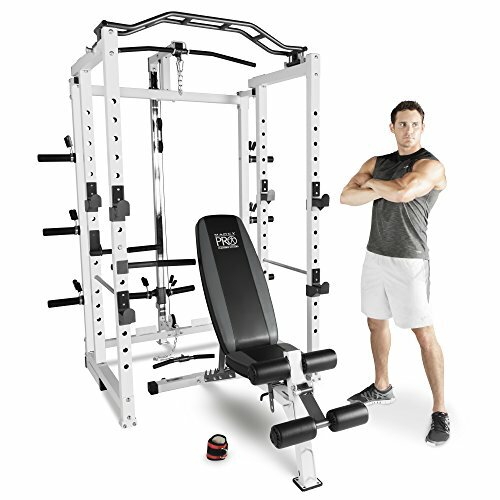 Built for the serious home strength trainer who wants a durable, customizable cage for a pro weight room, this cage system has all you need to pump some iron and get your best-looking physique. Versatile for a variety of work outs including squats, shrugs, chin ups/pull ups, incline/decline bench press, deadlift, shoulder press, and many more. Equipped multi-functioning cage that has a lift and roll bench for easy transport and a cage that folds for storage and convenience. It's solid, durable construction allows a maximum user weight of 300 pounds to support your intense pull-ups, leg exercises, chest presses, and everything you do to feel the burn. The bench holds a total weight of 600 pounds and the bar catches support 300 pounds. When this Marcy Pro Foldable Cage is in your home, there are no days off. Set this thing up and it'll be the motivation you need in your dwelling to train and stay healthy and fit.